Looking for a new idea for breakfast-on-the-go, or a post-workout snack? 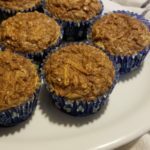 These apple cinnamon protein muffins are the perfect healthy treat. Protein-packed and gluten-free — you’ll be psyched to start your day. These tasty protein-packed muffins are great for a quick on-the-go breakfast or post-workout snack. They're also gluten- and dairy-free, and are only 120 calories each. 2. Prepare a muffin pan with paper muffin cups (for essentially no clean up) or grease with an oil high in monounsaturated fats, like avocado oil. 3. Leave one cup of gluten-free oats whole, and grind the other cup into a fine flour using a food processor, or high-powered blender. 4. Core and seed the apples, leaving the skin on. Then shred them using a box grater. Fill 12 muffin cups with the batter to the top of each cup. Bake in oven for 18-20 minutes. A toothpick inserted into the center of the muffins should come out clean when done.